Hug your hygienists this month! And follow their oral health advice. 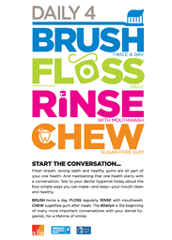 Their message for October, which is National Dental Hygiene Month, revolves around “The Daily 4” and the difference Brushing, Flossing, Rinsing and Chewing can make for your patient’s oral health featured in the poster shown above.